Budgeting can be a simple and straightforward process. It can also be a rewarding experience for all family members. But, it takes interest and commitment. Here are seven steps to help you create a successful budget. Discuss Values – Determine what is most important to the people involved in your budget, or spending plan. By understanding these values, you can make decisions that will provide you with the most satisfaction. Set Goals – Begin setting goals by discussing with family members what each one may want to do with their money. An example of a goal might be to save for a child’s education. Have each member list the goal and a deadline. Work on the most important goals first. Put money aside – Allocate some of your budget for your priority goal. Remember, to achieve your special goal, you must treat the money as a bill to be paid to you. Determine Income – Figure out your net pay, or the money that is left over after deductions. The money that makes up your income can come from sources such as salary, allowances, social security or child support. Do not include overtime pay. 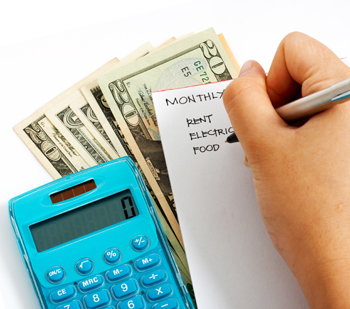 Determine Expenses – What are the expenses in your budget? Consider fixed, variable and periodic expenses. Fixed expenses consistently stay the same every month, variable expenses vary from month to month and periodic expenses are not due every month. Create a Plan – Design a spending plan so that your income will allow you and your family to have what you want and need. If you find that your income does not cover your expenses, re-evaluate your plan and decide what categories can be changed. Keep Track of Expenses – Keep a record of expenses to see where your money is being spent. By comparing your estimated expenses with what you are actually spending, you can evaluate whether or not your plan is working. Evaluate Your Plan – Periodically evaluate your spending plan. Is the plan still helping you meet your needs and achieve your goals? Remember that budgeting is the cornerstone of your family’s financial plan and a guide to help you achieve your goals.